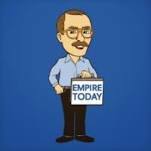 Welcome to Empire Today! Founded in 1959, Empire is a leading provider of installed carpet, flooring, and window treatments to more than 75 markets across the United States. Whether you’re looking for Carpet, Hardwood, Laminate, Tile, Vinyl, Luxury Vinyl, or Window Treatments, we can help you find the product that meets your style and budget requirements. We offer quality, name-brand products from the brands you love and trust, like Shaw, Mohawk, Beaulieu, Armstrong and more. We are a “shop-at-home” company, which means we bring hundreds of samples right to your home. We offer FREE In-Home Estimates that can be easily scheduled online or by calling 503-333-3328. During your appointment, i will help you choose a floor, take accurate room measurements and provide an all-inclusive price estimate with no hidden fees. And, there’s no need to wait weeks - Empire’s professional installers can install in-stock Carpet, Flooring, and Window Treatments as soon as the next day*. With a winning track record of superior quality, value, and customer care, Empire has proudly fulfilled the needs of more than 2 Million Satisfied Customers. We are committed to making your experience purchasing Carpet and Flooring simpler than ever and we strive to deliver exceptional quality and professionalism. This is why we offer many unique promises, including our Low Price Guarantee and the Installation Warranty**. Plus, we service the manufacturers’ warranties, which means that if you ever experience an issue with your product, you only need to call us. WINDOW TREATMENTS: Next Day Installation on select products and styles for orders received by 10 a.m. In select areas, Next Day Installation may not be available every day. **Empire Today® warrants that flooring installation work will be free of defects for one year after the date of installation.